Preheat oven to 350° F. Spray bottom and sides of 9-inch square baking pan with non-stick cooking spray. Place 1/2 cup butter into baking dish and melt in oven. Remove from oven and sprinkle with brown sugar. Arrange pineapple rings over brown sugar. Place cherry in center of each pineapple ring. 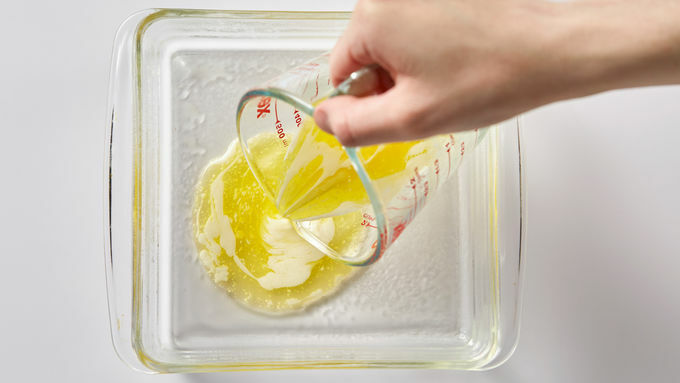 Prepare cake mix with water, 1/2 cup melted butter and eggs according to package directions. Divide in half. Pour half (about 2 cups) over pineapple and cherries. Use other half as desired (bake separately or use in second upside-down cake recipe). Bake cake at 350° F for 45-50 minutes, until toothpick inserted in center comes out clean. Immediately place heatproof serving plate upside down over pan; turn plate and pan over. Leave pan over cake a few minutes so brown sugar mixture drizzles over cake; remove pan. Serve warm. Store cake loosely covered. 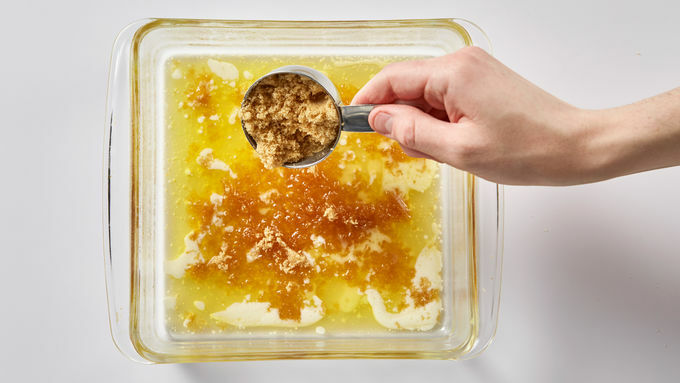 Cut the butter down to 1/4 cup for the brown-sugar topping mixture if you really, really must. I looooove butter, so I kept it at the old-fashioned proportion, but (as much as I hate to admit it) the recipe works great either way. 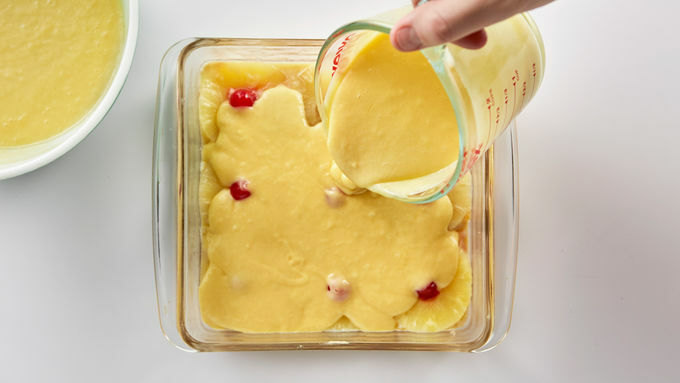 Instead of plain water, use water plus juice from the pineapple can and maraschino cherries jar to add up to the same liquid measurement for the cake batter. Peaches or blueberries or other stuff work with (or instead of) the pineapple. Experiment! Oh, nuts! Sprinkle chopped pecans or walnuts over the brown sugar to add the crunch you love. Yep, there's even an easy gluten free version that starts with a Betty Crocker™ gluten free cake mix. 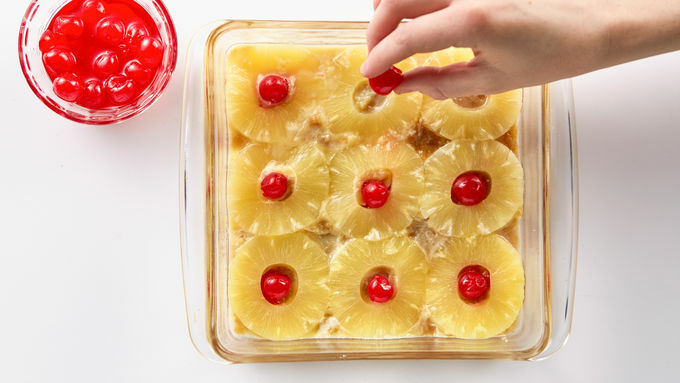 This updated version of Easy Pineapple Upside-Down Cake shares DNA with its grandma that's made from scratch, except this younger version starts with a Betty Crocker™ cake mix for quick prep so you can make it on the fly. I looked up the buttery retro from-scratch recipe and made it just the same -- except I used a Betty Crocker™ cake mix instead of making the cake part from scratch. OMG. Delish wish on a plate. In-cred-i-ble. 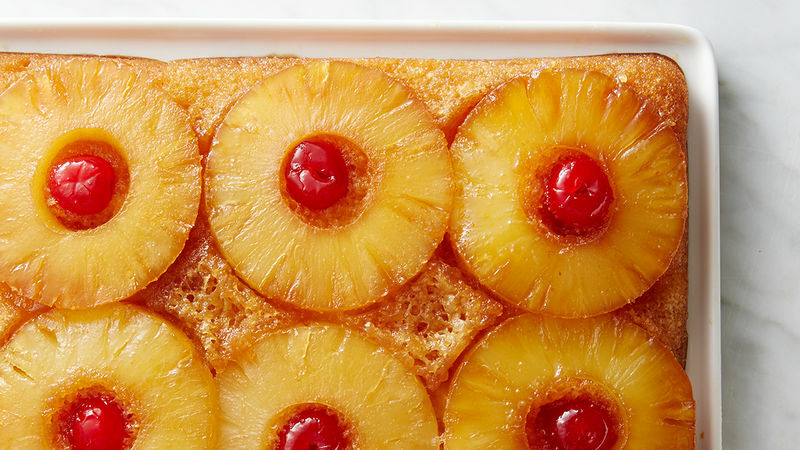 You'll be amazed at how easy this new-fashioned version of this old-fashioned fave is. Not kidding. That's it. Easy or what? So, all that's left is to snag some cake-eating buddies and start inhaling this dessert while it's still warm. Plop whipped cream on top, if you'd like. Or not. It's a sweet, soft, caramel-covered delight even on its own. So you like pineapple recipes, huh? Lucky for you, we do too! Try one of these tasty temptations on for size.